Ecobake's paper baking molds for panettone alto are perfect for baking muffins souffle pound cake and cupcakes. Manufactured on high-precision automated production lines, which provide a minimum size tolerance, making the molds suitable for use on automated destackers. The vertical band is made from non-stick, grease proof, corrugated paper, approved for direct food contact.The base is made from non-stick, corrugated, micro-perforated paper, approved for direct food contact.The printing inks used can withstand high temperatures and spraying with preservatives.
? Products cooked in paper containers require lower cooking temperatures and shorter cooking times than aluminium. Ecobake uses carefully selected, highest quality raw materials in the manufacture of its products. Ecopack is UNI EN ISO 9001:2008 certified for Quality Management Systems and complies with European standards. It is also certified BRC (Issue 5) for Packaging and Packaging Materials. 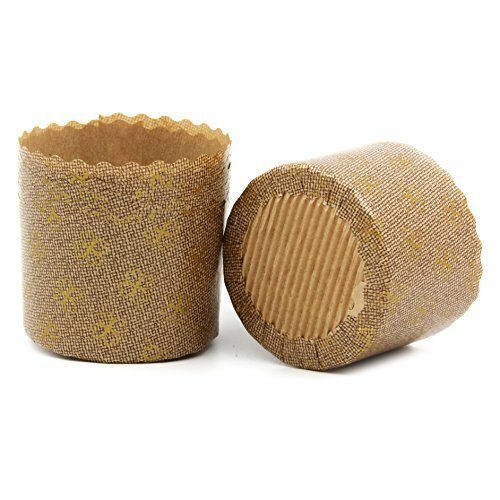 NON STICK GREASEPROOF PAPER: Ecobake's muffin baking cups or Panettone paper baking molds are often used as a non-stick and disposable souffle cups, corn muffins cups, pound cake mold, as well as other flavour muffins . Ecobakes cupcake molds / muffins cups come in a veriety of forms and sizes. Baking paper is used to prevent baked products from sticking to the pans .This use is beneficial because it eliminates the need to grease baking pans.